When I saw the headlights of a wedding car shining through the thick winter fog the other day, I knew the appointed photographer for that wedding would need some seriously good luck to produce a satisfactory wedding album. Natural light in the winter is hard to get and limited to only a few hours. If you have to take photos outdoors, schedule the session for the morning when light is the best. It is best to take outdoor wedding photos in natural light with a reflector and a tripod. If you use a flashgun, make sure to use a diffuser to soften the light. Off-camera flash is better than on-camera flash. Dress warmly. Do I need to say why? Many brides may be happy to endure the freezing temperature and pose in only a wedding dress for that perfect shot of a lifetime. However, if the photographer is feeling cold, s/he will naturally rush through everything to get back to the warm venue. So make sure to wrap yourself in many layers against the elements and stay calm through the shooting session. Advise the bride and groom to bring a coat to keep themselves warm in between shots. Be aware of the winter sun–if there is one. If you shoot toward the sun or position your subject in the sun it can cast harsh, long shadows that may distract the viewer from the subject. If it’s snowy, take advantage of the clean, white backdrop that you will not get in other times of the year. Pop out any brightly coloured objects, such as the bride’s bouquet or the bridesmaids’ dresses. If you want to include winter landscapes in your photos, the stark and bleak view usually looks better in black and white than in colour. Positioning your subject against an endless, cloudless sky and clean white backdrop can create atmospheric, high-key shots. I hope these tips help you get through a freezing wedding photo shoot and achieve great results. Good luck! This articles was written by Jun Moore. Check out Simple Wedding Photography, it covers everything you need to know to photograph a wedding and the business behind it. From diagrams of where you should stand throughout the ceremony to advice on all the final deliverables to the client. This 200 page ebook will be useful to wedding photographers of any experience level. It also carries a 60 day guarantee, so there is no risk in trying it. 30% off today only for boxing day. Cats have it pretty good — basking in the sun, taking catnaps, walking around like they own the world. Ancient Egyptians believed that cats were sacred and practiced a religion based around a cat-like goddess. And sometimes it seems like our feline friends are trying to convert us! Today’s photo features a tabby cat having a good ‘ol time, enjoying a sunny day in a field of tall grass. 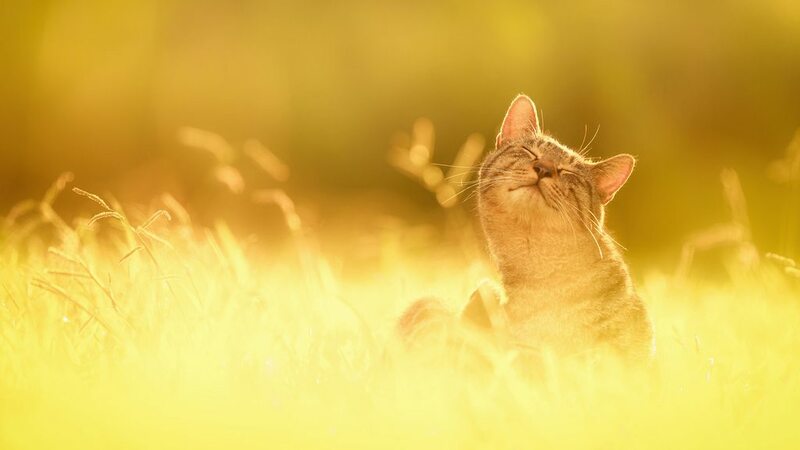 Captured by photographer Seiji Mamiya, the sun-drenched photo is bathed in a soft yellow glow, giving a feeling of warmth and contentment. Whether you’re a “cat person” or not, doesn’t it make you wish you could be a cat, just for a day? The shot was captured with a Canon EOS 5D Mark II and an EF70-200mm lens at 200mm, f/3.5. Some photos capture news events that made headlines worldwide, such as the death of Nelson Mandela. This photo captures 24-year-old Nelson Tavares working on a commemorative mural in Lisbon, Portugal. Others show a very personal moment in the wake of disaster. Following a fire set by an angry mob, 68-year-old Azra looks at her dead pet bird in her destroyed Badami Bagh in Lahore. All photos capture specific moments, but some of the best pictures of the year make time stand still. Here, a child gazes at jellyfish at the Vancouver Aquarium in British Columbia, Canada. While you may not recognize every event or person photographed in these pictures, there’s no doubt that each photo evokes the raw emotions that represent these major events we experienced in the past year.